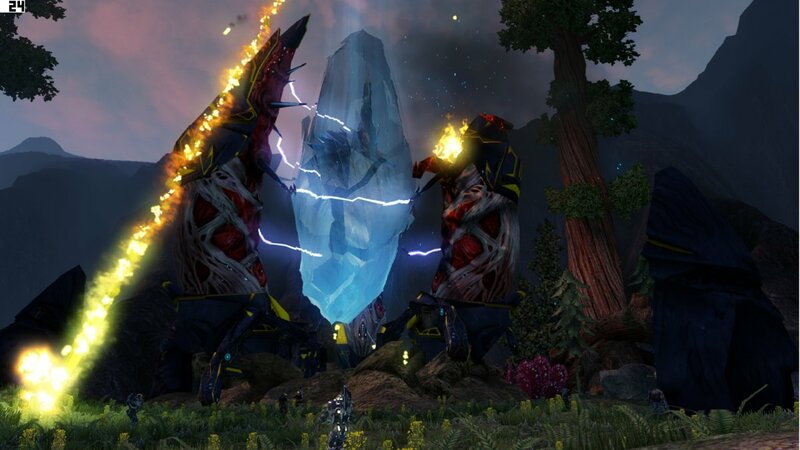 Defiance: The PC MMO Totally Unprepared for PC! 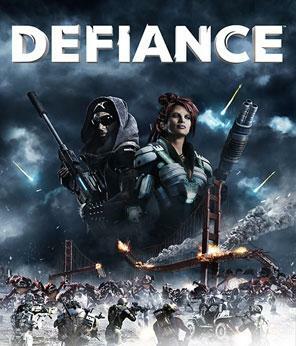 I suppose it’s about time I share some of my thoughts on the latest entry to our MMO library, Defiance. My enthusiasm for this game has ebbed and flowed during the PR cycle but never much broke lukewarm. To be honest, I felt like an outlier. When most of the internet seemed to join in a collective squee over the prospect of a combined MMO and TV show, I was busy standing on the sidelines contemplating just how prone to failure the whole thing was. Don’t get me wrong, I realized that it could be cool, but let’s be frank: SyFy is the network that brought us Camel Spiders; they don’t exactly have a nose for quality. So Trion’s big follow up to one of my favorite games of all time, RIFT, would be an unproven entry into a incredibly difficult to break into genre and tied to a TV show that likely be cancelled by its third season? Not optimistic, despite my penchant for finding the positive in things. Optimism for Core Gameplay. It’s Greeeeeeat! Now that I’ve gotten my hands on the game and spent around five hours with it, I feel confident in sharing that I am both optimistic and extremely disappointed. Let’s start with why I’m optimistic. The gun game is wonderful. I’ve been rolling around with sniper and assault rifles to clear out packs from a distance and then close in to finish the job. Lag is mostly a non-issue. Any time I’ve lined up a headshot it hits for critical damage. When it doesn’t it’s because the mutant was moving. Guns come in all flavors with a wide range of stats, much like Borderlands. You can also chain together kills for extra damage and see the effect of weapon modifiers (fire, electricity, etc) on enemies. You spend the bulk of your time shooting or pressing “E” over things, so the gun play has got to feel tight. It does. I turned on the damage indicators, which really should be on by default but aren’t, and it’s deliciously satisfying to see the numbers fall off like rain. And that right there is it: the reason for great optimism. Gun play is the core of the game and it’s a blast (no pun intended). It also helps that I’ve found the world a really interesting place to run around in, what with its terraformed landscapes and giant, lantern-holding mushrooms and all. The story quests pretty interesting too, but that may be a result of pretty much everything being a mystery. I’m actually looking forward to the show revealing more about the game world and big story events, though not having main points explained up front is as confusing as it comes. I would also like to disagree with a fellow blogger I enjoy reading. In his post, he mentions that Defiance and RIFT are cut from the same cloth and that players who don’t like RIFT aren’t likely to enjoy Defiance either. Now, maybe I’m missing something, but apart from the dynamic events, the two games are nothing alike. 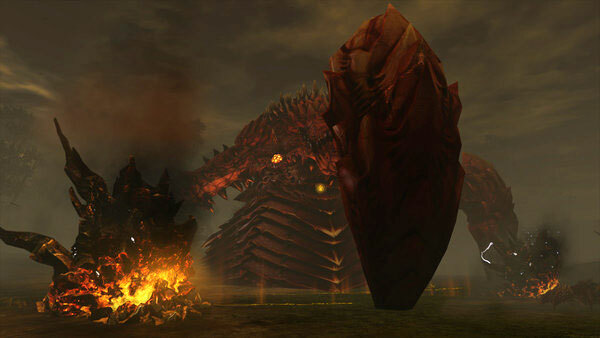 RIFT has rifts, and Defiance has Arkfalls which, indeed, are very similar. But apart from this piece of shared tech, the games are nothing alike. Their gameplay styles are so vastly different that it would be like comparing World of Warcraft to Borderlands 2. I just don’t see that. Even if you hated RIFT, it’s hard to argue that random, rewarding, and optional bits of cooperative content are a bad idea. Defiance puts its own, shooter-friendly spin on them, so I content that even if you hated RIFT, that doesn’t mean Defiance is a lost cause. Now to the disappointments. Where do I begin? Oh, I know: Trion should be absolutely ashamed to have pushed this thing to the PC market in its current state. Defiance holds the distinction of being the first MMO to launch simultaneously across platforms. It’s also the first MMO that feels like it was never intended for PC in the first place. Which isn’t to say the console versions are so great, but without seeing them, all I have is a buggy console port that feels like an afterthought. Feels like an afterthought + bug ridden = connected dots. And it’s not even a good port. You have three customizable graphics options. Bloom, motion blur, shadows on/off. There is no screenshot button or way to hide/customize the UI. Menu navigation is obviously designed for a controller with the nuts and bolts settings being stuck in a radial menu, because you know how necessary those are with a mouse and keyboard. Trion doesn’t even deign to put patch notes in the updater like they do with RIFT. Why? Because console players don’t care and they are the intended audience. (Someday we’ll have to have a talk about why it’s a terrible idea to target console players first with cross-platform MMOs). This is the company that gave us RIFT. There are no excuses for this slap-dash job. They should know better. And in fact, I’m betting they do but pushed the game out the door to preempt the TV show. Are we enjoying are cross-media yet? So here’s the deal. In the time I played, the game crashed to desktop three times. Once was due to hitting escape to access the menu. Turns out those of us with 100Hz+ monitors can’t open the menus with the keyboard without a convoluted workaround (an issue since beta). Chat doesn’t work in most of the first zone. There is no quest log and they bug out often. On multiple separate occasions I had to move on or abandon them. More than once I interacted with an object only to have it not give me credit. Dropping missions is also pain and requires stumbling upon the option on your fullscreen map. Since you can only take one mission at a time, prepare for a hike to pick it up again after. There’s more. Cover is inconsistent and trips you up as often as saves your hide. The reticle doesn’t line up correctly when using it either. If you’re peeking out from behind cover with your crosshairs on an enemy but the tip of your gun isn’t completely outside the cover wall, you’ll miss. When using a controller, vehicles will sometimes despawn after you’ve left them, hopped back in and try to move. Dynamic events sometimes disappear midway through completing them. Keybinds don’t save consistently. Mobs seem to spawn erratically and based upon your location to their area. It goes on. There’s no easy way to tell your level. What the hell is an EGO rating? Your self-worth as an Arkhunter? How do you level up skills? What do these stats mean? What, how, where?! Someone should turn that into a theme song for Defiance. Nothing is explained. No-thing. From systems and mechanics, to the entire reason California went to the mutants. And so long as chat is broken, good luck getting an answer. It’s really pretty terrible. Quest design is also rote MMO fare and does indeed seem a little repetitive on the “locate and tag” front. The combat missions are fun, though, and I often found myself killing enemies just because I could while on my frequent searches. At its core, Defiance is fun and I’ve enjoyed my time there, but it’s also an unfinished console port and an incredibly weak effort from a company we know can do better. That said, all those bugs could be patched out and what it does well is the single most important thing it needed to do well. After playing around in the world they’ve created, I’m also convinced that if the show is decent, it could mean very interesting things for the game. Evolving story arcs in this setting could be fantastic and solve a lot of the concerns people have with quests feeling repetitive. Do the weekly installment! A note on quests. I’m becoming more and more convinced that professional reviewers, like those at IGN, just don’t understand MMOs. At the end of the day, almost all any MMO offers is a variation on killing and collecting things, with possibly a touch of crafting. It’s a limitation of modern design that, yes, we are slowly moving away from, but, no, isn’t a reason to tear apart a game. Guess what? Tomb Raider was about killing and collecting things. Bioshock Infinite is about killing and collecting things. WoW, GW2, TSW, RIFT, LotRO and every other AAA MMO is too. Defiance does hit too frequently on the “find and scan” mission types, but to use that as the primary criticism when there is so much more on hand just tells the world you went in biased against MMO gameplay. Unfortunately I didn’t get much time in the beta with this game. I couldn’t solve some display issues I was having with the latest nvidia drivers I was using. No structures of any kind would show up at all. From the escape pod at the beginning to the bases to the crash debris that should of been there, all of it was invisible for me. Combine that with the mediocre at best ui for pc and enemies floating in the air and I was uninstalling within the hour. I do agree that the shooter portion did feel pretty good though. The tv show didn’t really grab me in the 14 minute preview we were given but I will check out a few episodes to give it a shot. while the game play can be rather fun.. even over long periods everything about the ui and menus are just terrible. I had the problem that every time i tried to go to the menu it crashed to desktop. It feels very unpolished . The questing seems extremely linear as well to the point of being very constrained on one set path, and with the lack of a quest log it is more frustrating then anything else. 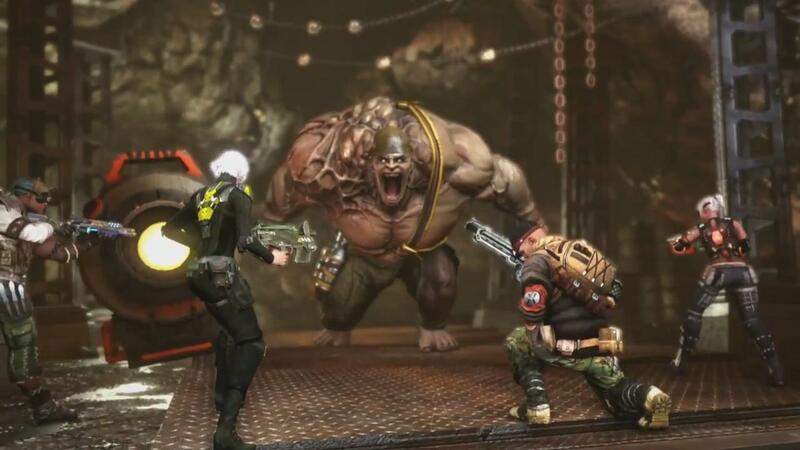 Defiance isn’t a terrible game but it definitely isn’t a great one either. There are still some bugs, controls feel a bit awkward, and the content is very, very repetitive. The new DLC is coming out on the 20th but even that only adds a few new weapons, a new story line, and a couple world events. It was fun for a short while but after that it became nothing but a grind fest for EGO points.